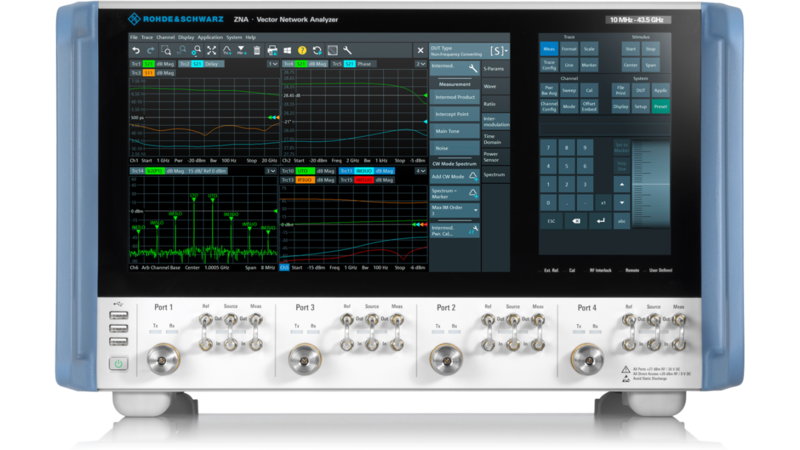 The Rohde & Schwarz vector network analyzer portfolio. Precise, fast, versatile. Vector network analysis (VNA) is one of the most essential RF and microwave measurement approaches. Rohde & Schwarz offers a wide range of versatile, high-performance network analyzers up to 500 GHz and multiport solutions up to 48 ports. A Rohde & Schwarz vector network analyzer is the perfect tool for analyzing passive and active components such as filters, amplifiers, mixers and multiport modules. The network analyzers feature excellent RF characteristics and a wide variety of analysis functions that help the user evaluate important parameters at a glance. Offering outstanding RF characteristics and a unique hardware architecture, the R&S®ZNA high-end vector network analyzer makes demanding measurements easier than ever. Another feature new to the market is the analyzer's DUT-centric operating concept, which guides users quickly and conveniently to the desired measurement setup. Two independent touchscreens provide utmost flexibility for smooth, efficient operation. For more information visit our product website. Vector network analyzers with excellent performance and versatile functions for active and passive devices up to 500 GHz. Vector network analyzers with top speed, wide dynamic range and excellent ease of operation, from 9 kHz up to 40 GHz. Compact 3-in-1 portable network analyzers deliver solid performance for field applications. Various products such as millimeterwave converters and configurable signal conditioning units for complex measurement tasks. Measurements on multiport devices and parallel measurements on several devices: 48-port switch matrix solution, 24-port true multiport network analyzers and a combination of both provide highest flexibility. A wide range of accessories such as manual and automatic calibration kits, attenuators, test cables and adapters complete the R&S network analyzer portfolio. Solutions to optimize the performance of your components and devices. Measurement solutions for applications, including satellite, radar/EW and avionics applications.